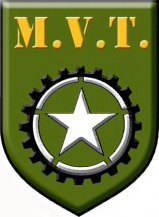 Military Vehicle Trust . . . the world's biggest and oldest military vehicle club! If you would like to be notified via email when the MVTSEM website is updated, please send an email requesting this to petegerry@btinternet.com including your name and MVT membership number. By doing this you are consenting to the webmaster keeping your name and email address on a database. Your email address will not be shared with any third party. Please note, this is a temporary website, due to circumstances beyond our control. Please bear with us ... we should be back to normal soon! Go to the Latest News section for, well, the latest news!